Morning Coffee & Afternoon Tea: Happy Valentine's Day! Ok, first I have to apologize. This is NOT the recipe for cream cheese brownies that I've been promising. I will get that posted soon. I will, no really, I will!!! But for today, I'm bumping some old posts here by way of wishing everybunny a Happy Valentine's Day. Be sure to take a trip back a year and visit the Valentine's Day Carnival of the Recipes, which has some truly splendelicious goodies for you and your Valentine. First, I baked some Wally-Mari-Brownies (that's brownies with walnuts and marascino cherries inside). 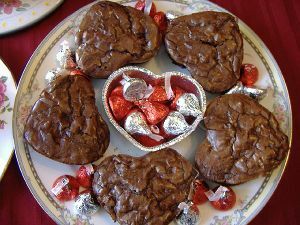 I just used a brownie mix, and these cute little heart-shaped tins I found in the baking aisle. Added some chocolate kisses to the plate because ... well... you can never have too much chocolate. 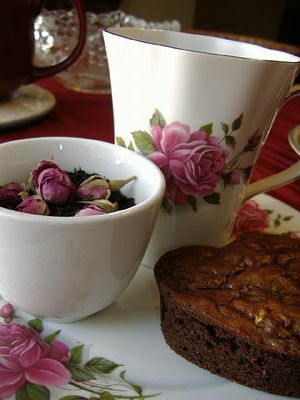 The perfect complement to go with the brownies: Rosebud Gong Fu tea, which just arrived from JingTeas.com. This is the perfect tea. I lovelovelove it. 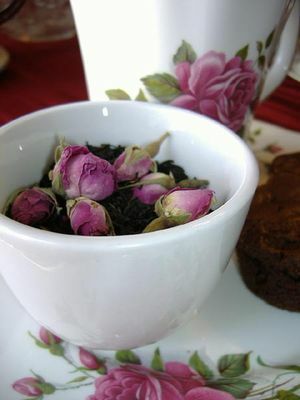 Lightly scented/flavored, and there are tiny little rosebuds right in the tea. It's a treat for all the senses. 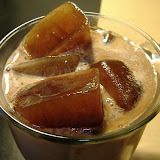 Pretty to look at, wonderful smell, the taste is perfect, and the little afterbreath of roses is delightful. And of course, the only possible china to use was my gold-rimmed roses cup and plate. Nice post. I hope there are more parts to your advice. I like dogs -- really I do -- but I don't think I want one of my own.Thanks! I really like your blog so much because it has a lot of new interesting things that you posted and this one looks interesting! I really like your blog so much because it has a lot of new interesting things that you posted and this one looks interesting! What an amazing tea....thank you for posting this. I plan on scrambling through the web to find some to drink asap just made some crazy mad hatter cake stands and fancied something a bit different to sample. I enjoy a cuppa, in china cups with flowers on them; and my husband's photo of our outdoor tea table accompany an article I wrote for Country Woman this summer. i'll try to do such stuff next time! Oops! I missed the post on the valentine's day. I wish I had read this before, I could have made such good stuff for my valentine and made her a lot happy. Wonderful to see a post. Your blog is like a slice of heaven. Love it!